This book is definitely a D’s Cool Pick! “The Complete Organic Pregnancy” by Alexandra Zessu. I think the name says it all! I photograph so many Boulder moms and babies I want to help keep them safe and healthy! In this exhaustively researched book, the authors (calmly) talk parents-to-be through everything from the safest laundry detergent to which crib mattresses contain toxic flame retardants. You’ll find out how to choose the right face cream, plastic water bottles, household cleaners, types of fish, and much more—all with an eye toward keeping you and your baby safe and healthy. 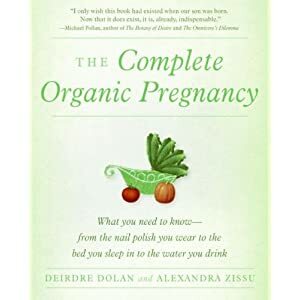 The Complete Organic Pregnancy also features a collection of personal diaries from well-known writers and organophiles, including Barbara Kingsolver and Marion Nestle, as well as recipes from organic chefs. Required reading for anyone heading into this exciting stage of life, The Complete Organic Pregnancy is your chance to make a difference for your children, even before they’re born. Deirdre Dolan is a journalist whose writing has appeared in Harper’s Bazaar, Rolling Stone, and the New York Times Magazine, among other publications. She has written columns for the New York Observer and the National Post, and is the author of Curb Your Enthusiasm: The Book.